FILE - A plane preparing to take off as part of the joint airstrike operation by the British, French and U.S. militaries in Syria, is seen in this picture obtained Apr. 14, 2018, via social media. British and French officials are scrambling to determine how they can maintain military pressure on the Islamic State terror group once the United States has pulled out its ground forces from northeast Syria. Both countries have said they plan to continue airstrikes and ground operations in Syria, but the timing and scope of the U.S. withdrawal, say officials still reeling from President Donald Trump’s decision to withdraw U.S. forces, remains unclear and is complicating war-planning in London and Paris. The British and French governments are trying also to gain a clearer understanding, say officials, of Turkish military intentions in northeast Syria, and when or if the Turks, as they have threatened, launch an offensive east of the Euphrates River to attack the Western-allied Kurdish Peoples’ Protection Units, or YPG. The YPG is the main formation in the Syrian Democratic Forces, or SDF, the West’s only ground partner in the fight against IS. Turkey has been restrained from moving into Syria’s Kurdish-controlled northeast in the past by the presence of U.S. troops. Turkish President Recep Tayyip Erdogan said he would delay an offensive possibly for several months, although the Kurds say his concession shouldn’t be taken at face value. Turkey's President Recep Tayyip Erdogan talks during a news conference at the Presidential Palace in Ankara, Dec. 20, 2018. 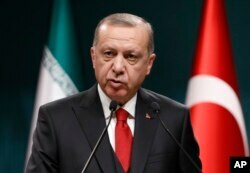 President Erdogan has threatened to smash the Western-allied Kurdish forces in northern Syria, arguing they are indistinguishable from militant Kurdish separatists in Turkey, who have waged a three-decade-long insurgency. Kurdish leaders hope Washington will continue to press the Turks to hold off. “It’s their duty to prevent any attack and to put an end to Turkish threats,” says Aldar Khalil, a senior Kurdish official. In the meantime, they are renewing talks with Damascus, using the northeastern oil fields, which they control, as leverage to strike a semi-autonomy deal with Syrian President Bashar al-Assad. A critical question for London and Paris, say defense officials in both capitals, is whether the YPG will be able to keep control of the 800 IS prisoners it holds, many from European countries. Kurdish officials warned Friday French President Emmanuel Macron's representative to Syria, François Senemand, that if Turkey does attack, it would create a chaotic situation in which they might not be able to spare the guards to make sure IS detainees are secure — let alone continue with an offensive against remaining IS formations along the border with Iraq. The IS prisoners include two Britons accused of being members of the so-called "Beatles" murder cell, responsible for the torture and beheading of Western journalists and aid workers, including American reporters James Foley and Steve Sotloff. FILE - U.S. journalist James Foley, right, arrives after being released by the Libyan government, in Tripoli, in this picture taken May 18, 2011. Foley was kidnapped on Nov. 22, 2012, in northern Syria. The Kurds have long pleaded with European governments to repatriate foreign fighters to be prosecuted in their home countries, but to no avail, despite the Kurdish pleas being echoed by Washington and the families of journalists and aid workers murdered by IS. Now there’s rising alarm in Western capitals that the U.S. withdrawal may trigger a chain of events that will lead to IS prisoners either escaping or being released by the Kurds, with the risk they could find their way back to the West, posing a major security headache for European governments. The Kurds say the only way to ensure their detention is for France and Britain to play a bigger military role in northern Syria. Some observers view the Kurds’ warning about IS detainees as an ultimatum. “Under the threat of the Turkish state, and with the possibility of Daesh [Islamic State] reviving once again, I fear the situation will get out of control and we will no longer be able to contain them,” Ilham Ahmed, a Kurdish official told reporters Friday in Paris. France has 200 special forces soldiers operating in Syria's Kurdish northeast as well as artillery units, part of an anti-IS international coalition trying to root out remaining pockets of militant fighters. 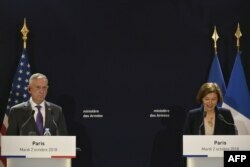 FILE - French Defense Minister Florence Parly speaks next to then-US Defense Secretary Jim Mattis during a press conference after their meeting at the French Defense ministry in Paris, Oct. 2, 2018. French Defense Minister Florence Parly told a French radio station she disagrees with President Trump’s assessment that IS has all but been annihilated. “It's an extremely grave decision and we think, the job must be finished,” she said speaking three days after Trump tweeted his order for U.S. ground troops to depart Syria, declaring IS defeated. U.S. Defense Secretary James Mattis resigned in protest midweek after he and other U.S. military and national security staff failed to persuade the U.S. leader to reverse his decision. On Saturday, it emerged Brett McGurk, the special presidential envoy for the global coalition to counter IS, has also resigned in protest. When Trump made his pull-out decision, McGurk was in Iraq briefing coalition partners about how the U.S. remained committed to keeping troops in Syria, both to finish off IS and counter Iran. His departure has added to fears that without the U.S. playing a leading role the 77-nation anti-IS coalition will fall apart. Britain’s defense minister has also pledged to maintain British airstrikes on IS targets in Syria, saying that although the anti-IS coalition has rolled up the militant’ territorial caliphate, IS “as an ideology and as an organization has become more dispersed. He warns of a possible IS resurgence. “We recognize we’ve got to continue to keep a foot on the throat of Daesh,” said Gavin Williamson, using an Arab acronym for IS. As well as mounting airstrikes, British commandos have been deployed in northern Syria. 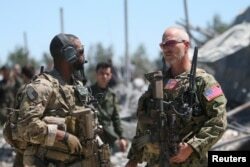 They are currently engaged with American special forces alongside the SDF in the mid-Euphrates valley, where an offensive has been underway since early September against 2,000 to 8,000 IS fighters, most of whom fled from Raqqa and Mosul when those cities fell. Despite progress, including capturing the town of Hajin, the offensive there have been episodic reversals with IS mounting mobile counter-attacks under the cover of winter sandstorms and fog, say British and American officials. U.S. airstrikes have been crucial in the battle. In October, the Kurds halted the offensive after Turkey bombarded Kurdish positions near Kobani, a town on the Turkish-Syrian border, where some of the Kurds’ IS prisoners are being detained. Asked if British forces could continue to operate without considerable American military support, Williamson responded: “We’re going to continue to look at all our options.” Officials acknowledge Anglo-French options would be much reduced, if they’re unable to call on U.S. air support, something that the Pentagon has so far not clarified. Some independent analysts have warned also that declaring victory over IS is premature. In a report issued last month by the International Center for Counter-Terrorism, a think tank based in The Hague, three analysts, Liesbeth van der Heide, Charlie Winter and Shiraz Maher, warned the militant group has the capacity to regroup.